Vahana Yoga & Eco-Tours is run by me, Astrid Jirka (pronounced Yeerka), a Certified, Advanced Hatha Yoga Instructor and Sustainability Educator, based in Ithaca, New York, USA. I have served in many roles with the aim of teaching people about personal health and well-being as well as the health and well-being of communities and the planet - through the lenses of yoga, ecotourism and international education. I grew up in a multi-lingual family, have traveled extensively for family, work and play and feel the Earth is my home. - raising a son all the way through high school! Merging my work as a yoga teacher, artist, sustainability educator, activist, and eco-traveler bring me great joy which I seek to share with others so that we can all radiate out into the world as healthy, happy human beings on a healthy, happy planet! Please join me on this journey to wellness and CLICK HERE to read more about my yoga trainings and background. Combining all these interests I’ve co-founded an organization called Yoga for the Earth as a tool and meditation on how to use yoga, the arts, and other peaceful means to take climate action for the benefit of generations to come. 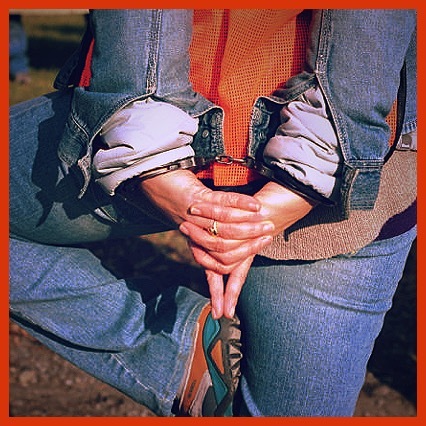 I have been arrested standing in tree pose to protect the clean waters of Seneca Lake. Please visit the webpage to see how you can become involved.